Description: A starfish with nine or ten arms. The dorsal surface is rough, with a close-set armament of clusters of fine spinelets. Colour varies from a dirty cream colour to a beautiful pink-purple. The tips of the arms are often turned up and pale coloured. Up to 40cm diameter, commonly 20cm. Habitat: Normally found on muddy gravel with boulders, or on silty rock surfaces in sheltered or semi-exposed conditions. Distribution: Recorded from the south coast of Ireland north around the British Isles to the North Sea. Apparently absent from the south coast of England and much commoner in Scotland. 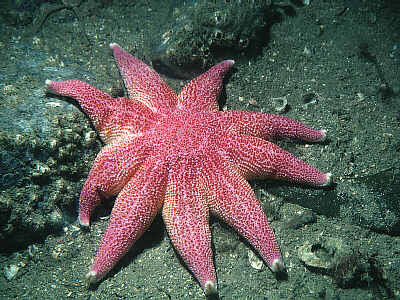 Similar Species: The only British starfish with as many arms is Crossaster papposus. The colour and texture is similar to some specimens of Henricia oculata but this species has only five (occasionally six) arms. Picton, B.E. & Morrow, C.C. (2016). Solaster endeca (Linnaeus, 1771). [In] Encyclopedia of Marine Life of Britain and Ireland.